Pretty good evidence that peak oil is about to be disproven by reality. Another prediction of doom crashes to reality. Man cause global warming is likely next. The “EIA” is the US Energy Information Agency, the US agency in charge of data about energy production, consumption, and use. It has just released its January 2014 Short Term Energy Report, with current and projected oil production figures. And “M. 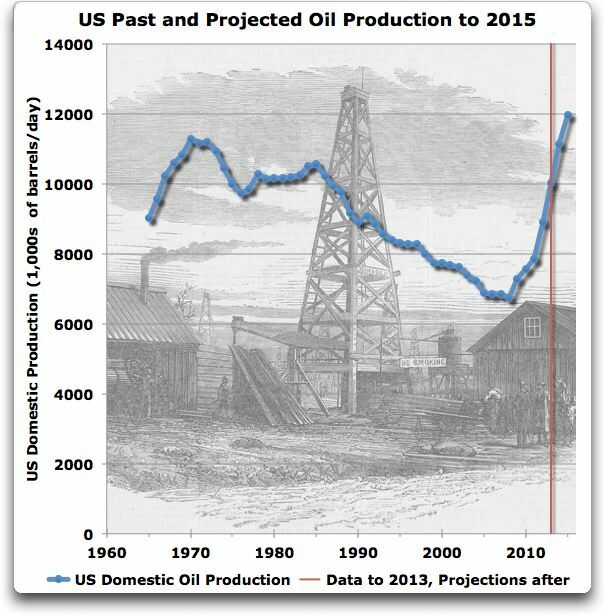 King” is Marion King Hubbert, the man who famously predicted in 1956 that US annual oil production would peak in 1970, and after that it would gradually decrease. So why is the King meeting the EIA? Figure 1 shows why. Figure 1. US crude oil production. Data from 1965 to 2013, projections for 2014 and 2015. As is customary, “crude oil production” includes what are called “natural gas liquids”. Data from the BP Statistical Review of World Energy and the EIA. ← Could this study on honesty and government service explain the EPA climateer fraud and ‘Climategate’ ?